** Quick note! ** Vanessa is a licensed realtor. If you are looking to purchase or rent property in the Greater Toronto Area, please let us know! Being an immigrant herself, she is happy to welcome immigrants to our country and share her experience of integrating into life in Canada. The Cozy Chalet is a converted 2 bedroom townhouse apartment located just 12 minutes walk from the Eaton Centre and Dundas Square, Toronto's spiritual centre. 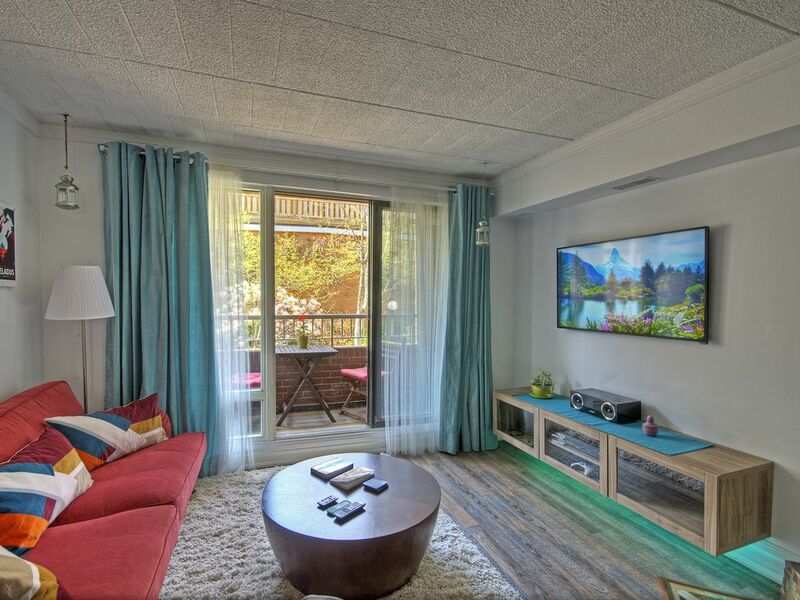 We've equipped the apartment it with all the fun things a modern traveler could want: a 4K LED TV, an XBOX One, two controllers, multiple games, an Apple TV 4 with Netflix, live BBC channels via the iPlayer, streaming TV via Bell app, movie library etc. In the kitchen one will find a Nespresso coffee machine, a stove, a fridge and a kitchen fully equipped for all your cooking needs. You'll shop for your ingredients 15 minutes to the south, in the world famous St.Lawrence Market, voted the best food market in the world by National Geographic in 2012. Pro tip: The St.Lawrence Market is expensive. You don't have to shop there just because we said so. There are lots of other options. The living room is equipped with a gas fireplace for cooler evenings, to keep everyone cozy. The master bedroom has a kingsize bed, an office desk with a 27" iMac and enough space for your laptop. We also added in a printer in case you need to print out your Toronto Maple Leaf tickets for the big game. The smaller bedroom sports a twin over full bunk bed, comfortably sleeping 3. This bed easily accomodates adults as well as children, as it is a full bed on the bottom, and twin on top. There are two balconies - one at the front, with a small table and two seats, and one at the back, with a small love seat, perfect for enjoying an early morning coffee. There is fast wifi on tap too (50/10m), there's Nothing Worse than a slow internet connection. Parking is included in our underground garage. Vanessa and I live 20 meters away (I measured), and we are here for you to ensure you have a wonderful time in Toronto. There are two balconies for our guest's enjoyment, and there is an underground garage to park a car. Optional dog add-on to your rental - We have a cuddly Morkie doggie named Misha, who you are welcome to play with, or not! Up to you. She loves children and fetching balls and toys and showing you how strong she is. We live just 3 doors down, and we're very proud of our city and we will definitely give you all the tips and guidance necessary if you so desire. Our neighbourhood is very central. The apartment is just mere minutes walk away from Yonge/Dundas, the Eaton Centre, St.Lawrence Market, and The Distillery District and Cabbagetown, 30 minutes walk from China Town and Kensington Market, 30 minutes walk to the CN tower .. etc etc. There are small cafes and restaurants, parks and hidden treasures awaiting the daring travellers not intimitated by the East Side's gritty exterior. We have written a guide for the area, and we live just nearby, ready to ensure your trip to Toronto is a great success. The Garden District a developing neighbourhood, unlike the posh (fancy) West side. You are likely to see more homeless people on this side of Yonge St, than on the West side. If this makes you uncomfortable, it would be best to seek accommodation on the West side of the city. Toronto is the safest metropolitan city in North America and it is best explored and experienced on foot or through public transit. We have provided a guide for walking tours around town to get you started. A car is not necessary, and there are even tours that pick you up in front of the house to take you to Niagara Falls, and they also deliver you back in the evening. Public transit is at your doorstep, though its really easy to explore the city on foot. Be prepared to discover Toronto's ethnic cuisine. This may require the addition of a second stomach, as food here is plentiful, cheap and delicious. We are LGBTQ friendly, and we love everyone. New on the Apple TV: NowTV, UK's SkyTV Entertainment pack and 13 live channels, including Disney, Nickelodeon and Nickelodeon Jr. Sport fans: We can add add Sky's sports pass for you on our NowTV for 20$ per week. This gives you access to Sky Sports 1, 2, 3, 4, 5. Vanessa and I love travelling so we decided to exercise our travel bug by hosting travellers from across the world. We are thoughtful hosts, we speak several languages, and we will ensure that your vacation experience is in Toronto turns out to be funtastic. We have two children, so we know how challenging it can be travelling as a family, so we've prepared a spot ready to address the needs of a modern family on vacation. The apartment is very VERY central, just a few minutes (7) walk from the Eaton Centre, however it is located in a private courtyard, so it is in a quiet and serene spot. It can sleep 5 people, comfortably. It is equipped with all the latest and funnest things, like an Xbox, a big screen LED TV, Netflix, an iMac computer for researching the fun things you need to do next.. and we also have bassinet for those travelling with babies. We pride ourselves in being thoughtful and caring hosts. We live 3 doors down from this apartment, as we consider ourselves ambassadors to Toronto. You will have the benefit of our knowledge and experience, and we will do our utmost to arm you with all the information needed for a fun and fulfilling vacation. We've even written a small guide to the area, and we can point you in the right direction. We have a landline for your landlining needs. There's definitely internets. We can turn it off if you want to be a luddite. We have a tiny European dishwasher! Its cute. There's a fridge. You can put food in it. The food stays cold and doesn't go bad. Thats good! Yes, there is an oven. You can fit several chickens in it. We have a Nespresso coffee maker, but also a drip coffee maker for those who enjoy large tasteless beverages. There is a kitchen, you will have some spices there as well which you are welcome to. We have a cute dining table that seats 5. There are stairs :( .. stupid stairs! Wonderful condo, very convenient location, hospitable hosts! Will be back for sure. Thank you! My family and I travelled to Toronto for 5 days. It was our first trip with our 19month old baby and we wanted somewhere that felt like home with all the conveniences but also close to the city. Calin & Vanessa’s place was perfect. It was cozy, ideally located, clean and exactly what we needed. It was a quick walk into the city from the place and really easy to find when we first arrived. I’d certainly recommend it to anyone traveling in a group of 2-4 needing the comfort of home while on vacation. Thanks Calin & Vanessa. We loved the house. Good location . Transport readily available ( streetcars buses to subways) but walking preferred to CBD or Broadview areas and east of DV Parkway. A good location for those accessing Young Street and the ever emerging Queen and King Street east areas. .17 Pembrooke is well set out with good security and underground parking . If you are looking for street level accommodation in a more centralized location this is it . We are ex Toronto residents revisiting our city. There is some social housing in close proximity which adds to the flavour of the area. This locality is undergoing significant redevelopment but the bulk of it is to the east . We found the beds great and the accommodation TV Wi Fi and shower , Kitchen facilities all good for an extended stay . In our case we were in and out . Calin and Vanessa . Thanking you for providing exactly what we were after . For the rest of you potentials . This is a great area in transformation. Be sure to walk and not miss the benefits of proximity to the lower city and business districts to the west and the emerging hospitality , cafe , craft beer and entertainment scene of the lower eastern streets . Great pockets of diverse Toronto culture surround this location. Calin was amazing and helpful. The courtyard and condo are safe, and great for everything that we needed. Hoping to stay there again soon. My wife and I enjoyed our stay in Toronto. The location is close to everything we needed, though it looks like the area is being improved, it is still a little sketchy. We never felt unsafe though and walked for groceries at the Metro or to the large mall. The property is nice, and well maintained. The beds are firm and I slept well (other than 2 raccoons that were having a disagreement with each other just outside our window). They were a little too stiff for my wife though, but she likes cloud type firmness:). We would stay again if we return. Upon check-in we require photo ID with the name matching the person booking the property and the credit card used. To minimize the chances of credit card fraud, we reserve the right to also photocopy/scan your ID (not your credit card) and keep a copy for 3 months following your check-out date. We've been subject to credit card fraud once before, and its really un-fun, ask us we'll tell you all about it.